Twentieth anniversaries are good times to look at how far you have come. And sometimes, a twentieth anniversary is the time to think about exciting new directions. The anniversary of welfare reform is no exception; in fact, it is just the time to think of a new approach to dramatically reducing child poverty: child allowances. Twenty years ago President Clinton signed the Personal Responsibility and Work Opportunity Reconciliation Act. The ending of legal entitlement to welfare has had a dramatic effect on low-income children. Welfare rolls fell rapidly and never recovered even as child poverty roared back in the wake of the Great Recession. Only 26 percent of potentially eligible families received aid by 2013, compared to 68 percent in 1996 when the the law was passed. If we had known then what we know now, we may have acted differently. 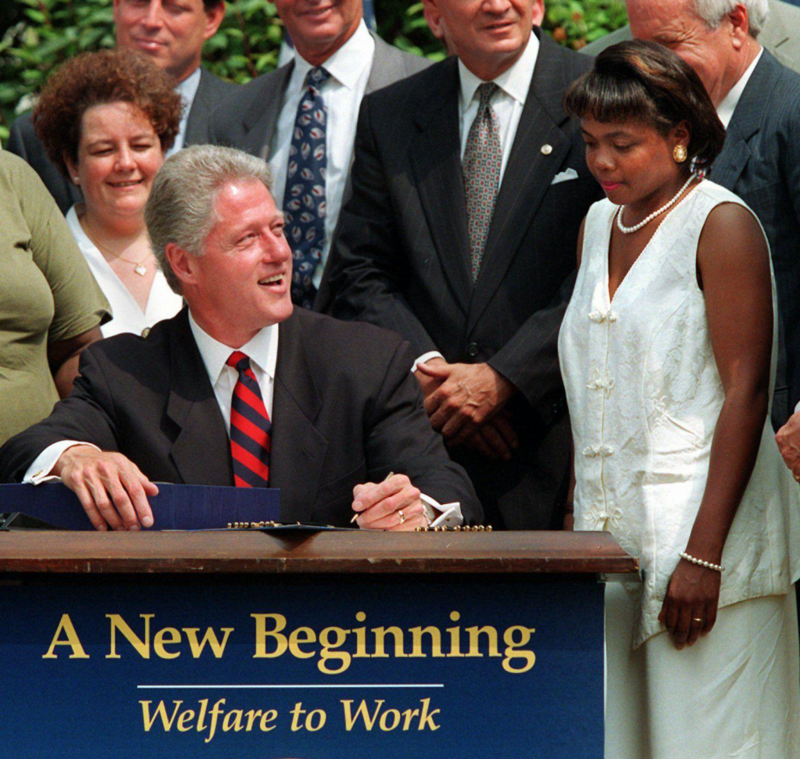 Clinton signing the Personal Responsibility and Work Opportunity Reconciliation Act of 1996. Even as we dramatically reduced spending on cash assistance, research has found that modest amounts of cash income in early childhood is transformative for children living in poverty. In 2010, researchers Greg Duncan and Kathleen Ziol-Guest found that a $3,000 increase in annual income, regardless of source, for children ages 0–5 is associated with a 17 percent increase in annual earnings as adults. The Earned Income Tax Credit, the expansion of which was a significant achievement of President Clinton’s push to make work pay, provides this amount to low-income families who have worked in the previous year. Rigorous research has found that this extra income facilitates infant development, reducing the incidence of low birth weight, have higher test scores in elementary and middle school, and are more likely to graduate from high school and complete one or more years of college. As adults, Cherokee children living in North Carolina receiving supplemental income from a casino committed less crimes, used less alcohol and drugs and were more likely to graduate from high school—with benefits exceeding costs by 3 to 1. The main limitation of the Earned Income Tax Credit is that it is designed to supplement low-earnings, and does not reach its full amount until a family with two children earns $13,620. The child tax credit provides an additional $1000 per child, but is only available to families that have $3,000 or more in labor market earnings. These family tax credits don’t boost children in families whose parents can’t secure work, and that’s a big problem. Employment rates of single mothers rose precipitously in the wake of welfare reform and during the red hot economy of the late 1990s. But employment rates have fallen significantly and those without work face the dramatic loss of wages and related tax credits, with no welfare safety net to fill in. Illness, lack of paid leave on the job, domestic violence, lack of child care, not to mention swings in the economy are among the reasons low-income parents can be unemployed or underemployed during critical early years of life. Without the guarantee of basic safety net, one in twenty children of single mothers lives in deep poverty (half the poverty rate, and just $840 per for a family of three)—a rate more than double before welfare reform. Many supporters of welfare reform hoped that states would continue providing that basic safety net, using funds from the Temporary Assistance for Needy Families block grant. But, twenty years later, that kind of welfare is dead. Significantly reduces child poverty. Universal child allowance could make swift and meaningful progress against child poverty that lingers at crisis levels two decades after welfare reform. A report by the Bernard L. Schwartz Rediscovering Government Initiative at The Century Foundation modeled a number of different options for a child allowance and found that a $2,500 universal allowance for children under six would lift 5.5 million children out of poverty and cut the child poverty rate to 10 percent. Link the concerns of children in poverty and middle class children. In today’s economy, both low-income and moderate-income children are being squeezed by the high cost of raising kids from childcare to diapers. Universal child allowances would target a wide range of families and have the chance to build a much durable political constituency than welfare. Solve for the stigma and work disincentives of welfare. Universal allowances would deliver additional cash income without the debilitating stigma of welfare and convoluted work search requirements that have dragged down welfare’s reach. Because the amounts are modest and don’t change when low income individuals get a job, they won’t provide the disincentive to work that welfare did. Fit within the 2017 tax agenda. The most likely outcome of an unpredictable 2016 election cycle remains divided government. Tax reform could be an issue that attracts bipartisan attention. Rep. Rosa DeLauro has already introduced legislation that would convert the Child Tax Credit into a child allowance, with eligibility for all families and monthly payments. A child tax credit was first suggested by Newt Gingrich as part of the Contract with America, and Senators like Marco Rubio (R-FL) and Mike Lee (R-UT) have proposed increases. These policy proposals represent a start to a bipartisan move towards a child allowance. Universal child allowances offer a unique opportunity to solve for some of the biggest shortcomings of welfare reform. There is exciting and growing momentum to build on the politically popular platform of family tax credits and create the floor of opportunity we know all children need to succeed.